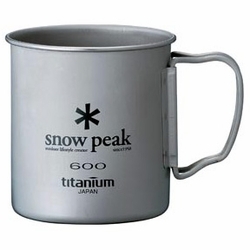 The Snow Peak Titanium 600 Single Wall Mug is made of durable and lightweight titanium. Weighing just 2.8 ounces with a 21.2 fluid ounce capacity, this cup is perfect for the ultralight backpacker, thru-hiker, climber or traveler. Also doubles as a small pot for cooking. Dual foldable handles fold flat for compact storage.